Regrettably, aging is inevitable, and eventually, the effects of time, gravity, stress, sun exposure, and environmental damage will take their toll on our shape, size, and skin. But we do not all age in the same way. Some people develop laugh lines around the eyes, while others develop a double chin. Some people grow too thin and gaunt, while others become fleshy and droopy. Whatever the effects of aging may be, we can all agree that we would give almost anything to restore the fresh, bright, glowing features we had in our youth. Fortunately, cosmetic enhancement procedures designed to correct aging in the face and neck region are no longer a one-size-fits-all proposition. For individuals who are experiencing the signs of aging in their cheek, chin, and neck area, a lower facelift with a neck lift can be the perfect combination of procedures to correct these symptoms. This combination procedure is ideal for individuals who have sagging and/or excess fatty tissue and skin in the cheeks, chin, or neck; a fatty or droopy jawline or jowls; a double chin or “turkey wattle”; lax neck muscles; and/or vertical banding along the neck. Many of these problems are extremely resistant to non-surgical correction, but with today’s state-of-the-art surgical techniques, a lower facelift and neck lift can revitalize your appearance safely and permanently. The face and neck are both very sensitive and highly functional areas, comprised of a network of facial nerves, arteries and veins. Therefore, it is critical that any surgery in this region be performed by a surgeon with extensive knowledge of the complexity and delicacy of these features, and with the experience to understand how changes in these areas affect your overall appearance and well-being. At Moelleken Plastic Surgery, with office locations in Beverly Hills and Santa Barbara, you will be in the care of Double Board Certified plastic and reconstructive surgeon Dr. Brent Moelleken. Dr. Moelleken is one of the few surgeons in the world to complete a year-long Aesthetic Surgery Fellowship at UCLA, and he will listen to your unique concerns before developing an individualized treatment plan designed to leave you looking youthful, revitalized, and naturally beautiful. 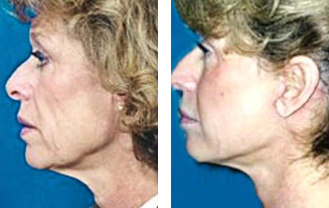 The neck lift is often combined with a laterally-based skin-tightening procedure—the lower facelift. While more extensive than a neck lift alone, the combination of a lower facelift and neck lift can be performed in the office as an outpatient procedure under general anesthesia, IV sedation, or even local anesthesia with oral sedation in the appropriate patient. The procedure generally takes about one hour, depending on the scale of correction required. During the procedure, the surgeon will make incisions either in the natural shadow line of the ear cartilage or behind the ear to minimize and hide post-operative scarring. First, the skin and fat of the lower face will be lifted and the fascia vertically tightened, giving the face a permanent, natural-looking lift. Next, the vertical muscles of the neck (platysma) will be interwoven together at the center of the neck, and a sling will be created to eliminate unsightly vertical banding. Any excess fatty tissue in either the lower face or neck will be removed through liposuction, and any excess skin will be tightened or removed. Once all the necessary corrections have been made to the muscle, fatty tissue, and/or skin, permanent sutures or adhesive glue will maintain the desired shape of the neck. 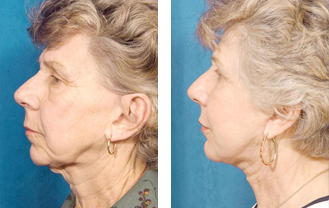 Recovery from a lower facelift/neck lift will take between seven to ten days, although brisk walking and other aerobic exercises should be avoided for a month or so after surgery. Immediately after the procedure, most patients will notice bruising and swelling around the jaw, ears, and neck. This will subside over the course of the next two weeks. The results of the procedure will be visible immediately after the initial bruising and swelling diminish, but patients will see continued improvement over the next 1-3 months as the face and neck tissues completely heal. Dr. Moelleken and his staff at Moelleken Plastic Surgery pride themselves on giving each patient the highest quality of care, from the initial consultation through the final follow-up visit. Our top priority is to provide every patient with safe, effective cosmetic surgery and to ensure beautiful, natural-looking results. Our welcoming, caring staff put the needs of the patient first. They understand how precious your time is, and will take care to ensure that your surgery fits conveniently into your busy schedule. Dr. Moelleken will provide a comprehensive overview of your treatment options and procedural details, creating a customized surgical plan designed to address your specific needs and give you a naturally-beautiful face and neck. If you would like to learn more about whether a lower facelift and neck lift might be right for you, please contact Moelleken Plastic Surgery today. We look forward to speaking with you, and to scheduling your initial consultation with Dr. Moelleken.